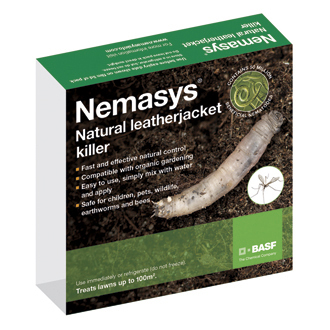 It is a natural product containing microscopic worms (nematodes) which seek out and kill Leatherjackets (larvae stage of daddy long legs) feeding on grass’s roots. -Apply to moist lawns from late August through to the end of October. -Minimum soil temperature is above 12ºC (54ºF). -This pack fills 8 watering cans and treats up to 100m2 (125sq yards).